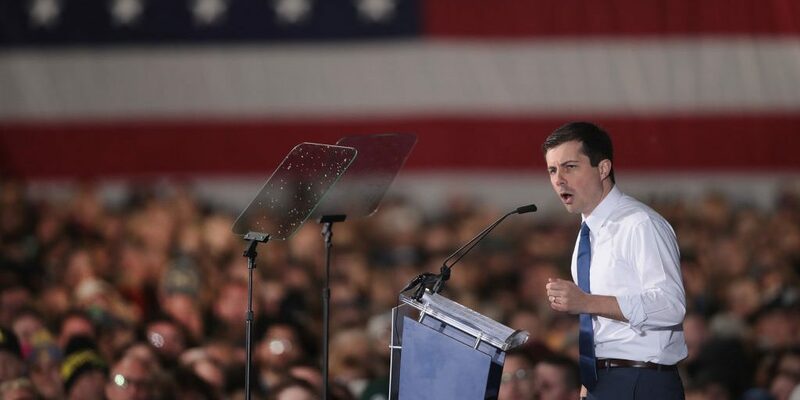 South Bend Mayor Pete Buttigieg announces that he will be seeking the Democratic nomination for president during a rally in the old Studebaker car factory on April 14, 2019 in South Bend, Indiana. Photo by Scott Olson/Getty Images. Saying that being the mayor of a small, struggling Rust Belt city has prepared him well for the presidency, South Bend, Ind. Mayor Pete Buttigieg officially announced and kicked off his 2020 campaign for President on April 14 in South Bend. Buttigieg, a Rhodes Scholar and Afghanistan War veteran who speaks seven languages, has emerged in the national spotlight in recent weeks as a contender for the Democratic Party’s nominee for the 2020 presidential election. His unofficial campaign raised over $7 million in the first three months of the year, the Associated Press reports. Additionally, some polls rank him only behind Vermont Sen. Bernie Sanders and an unannounced potential candidate, former Vice President Joe Biden as the most popular Democratic candidate in the upcoming election, according to the AP. Unlike Biden and Sanders, Buttigieg does not have high-level policy experience. “I recognize the audacity of doing this as a Midwestern millennial mayor. More than a little bold, at age 37, to seek the highest office in the land,” Buttigieg said at the rally, per the AP. In an interview with NBC’s Meet the Press, Buttigieg listed a decreasing poverty rate, cutting the city’s unemployment rate by more than half and leading the way for the city to grow in popularity and investment as accomplishments that he’s made while in office, according to Politifact.